Organization: University College London’s Mullard Space Science Laboratory, UK. 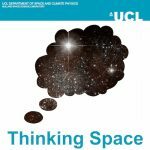 Description: Thinking Space is the podcast of University College London’s Mullard Space Science Laboratory, MSSL. We discuss science and innovation at the UK’s largest university space research group. In this episode, Dr Geraint Jones ( @einionyn ) interviews MSSL’s Prof. Louise Harra, Prof. Chris Owen, and Chris Brockley-Blatt about the European Space Agency’s Solar Orbiter mission, concentrating on the two instruments that have major MSSL involvement. As well as discussing the science, several aspects of working as part of an international consortium on building scientific instruments are also covered. Bio: Dr Geraint Jones ( @einionyn ) is a planetary scientist at UCL’s Mullard Space Science Laboratory who has worked on several space missions, including Cassini-Huygens, Ulysses, and Rosetta, and is involved in preparations for future missions such as the JUICE mission to Jupiter and Ganymede and ExoMars 2020. Geraint has previously worked at several other institutions, including NASA’s Jet Propulsion Lab and the Max Planck Institute for Solar System Research in Germany.